PA DEP Permitting, Sewer Extensions, and Planning Modules - D.L. 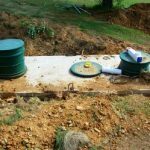 Howell and Associates, Inc.
PA DEP Sewage Facilities Planning is needed for nearly all subdivision/land development projects whether it is an on-lot septic system, connection to public sewer, or installation of a pump station. The Planning Module Application Mailer is the first step in this process and must be submitted for all new land development projects. The mailer information is used by DEP to determine whether sewage facilities’ planning is required and, if so, what type of planning is appropriate for a project. Upon determination by DEP as to what type of planning is required, the appropriate forms and plans are prepared and submitted to the municipality, county, and state agencies involved with the sewage facilities planning. Whether field testing needs to be performed for an on-lot system or gravity sanitary sewer needs to be designed, DL Howell is capable of handling all your planning module needs. DL Howell and Associates has a dedicated Environmental Team that will stay on top of the planning module process and coordinate testing, septic design, filing of applications, coordination of planning module components, all the way to approval.